Alejandra Ramos is a New York City-based food and lifestyle expert, chef, writer, and on-camera host. 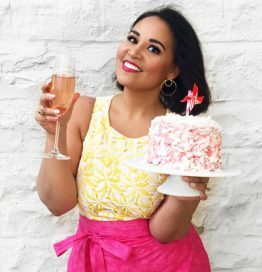 She is the creator of the blog, AlwaysOrderDessert.com, which features original recipes, entertaining ideas, and lifestyle advice that inspires readers to celebrate everyday moments and infuse a bit of indulgence into their daily lives. An experienced and bilingual on-camera personality, Alejandra is frequently featured on the TODAY Show, where she is as a member of the TODAY Tastemakers team of go-to lifestyle gurus, on The Dr. Oz Show as one of “Oz’s Favorite Food Bloggers,’ as well as other local and national TV shows. She has appeared as herself in a handful of national commercials for brands like Tostitos and Texas Pete. As a writer and recipe developer, her work has appeared in Cosmopolitan, Saveur, O the Oprah Magazine, Reader’s Digest, BUST, The Latin Kitchen, and Latina Magazine. She’s worked with dozens of major brands as a spokesperson and brand ambassador, and is a regular visiting chef at a Good Commons culinary and yoga retreat center in Plymouth, Vermont. Previously, Alejandra was International Editions Editor for Cosmopolitan magazine at Hearst Magazines International. She and her husband, Eugene Smolenskiy, live in Washington Heights with their dog, Hudson Riverton.